“Aole pau ka ike i ka halau ho`okahi … not all knowledge is found in one school.” Under the guidance of this Hawaiian proverb, I will share with you my views of the hula as I have learned it. For most people today, the hula means a wiggle here and a motion there. That is a gross misunderstanding! 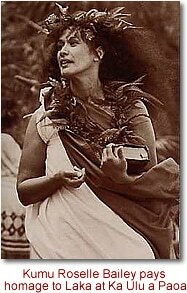 Yes, the hula is a very sensuous experience, but it is also an expression of prose and poetry. In this way, it is very much like the ballet and opera. For some, hula means the dance and music of the indigenous people of Hawaii. That, too, is true, but there is more, It is the dramatization and immortalization of the Hawaiian aho (lifeline). For others it means a way to economic independence and fame. That is also true though the aka uhane (spiritual essence) is always given recognition. As a practitioner of the hula and as the leader of Kahiko Halapa`i Hula Alapa`i, a hula school, it is my responsibility to see that my students are not only adept performers but also skilled craftsmen. It is also my duty to teach them to be sensitive to their environment. Most important, I must teach them to be true to themselves, so that they may achieve the unionization of mind, body and spirit. The great question is: How does one achieve these goals in this day and age when life is very complex and fast? In the days long gone, when life was less complex and quite slow, the hula was only for a select group of people. The group was totally committed to the hula. This commitment meant giving their loyalty, aloha and respect to their halau (school) and to their kumu hula (hula teacher). This commitment also meant that they trained, lived, worked and prayed together under strict rules until that moment of uniki (graduation). Then they burst upon the “stage” performing with enthusiasm to gain the admiration and support of their chiefs and their people. This was their livelihood! Their job was not only to inspire and entertain and recall and attract, but also give knowledge and truth with spiritual understanding. Today it is important for us to remember that the hula is a tradition that is dependent upon this classical foundation which allows for creativity. In our zest for creativity, an eye must be kept upon that classical foundation from pre-history in order to maintain the essence and uniqueness of the hula. Hawaii today is made up of people from all walks of life. Many learn to do the hula for sheer enjoyment, while others learn to hula so that they are able to entertain. Still others take hula lessons for the exercise, for therapy, to write a book, or to help them in their occupation. There are those who learn the hula because they ‘feel Hawaiian’ and want to learn the Hawaiian culture. Whatever the reason, the hula is no longer for a select group of people. It is open to anyone who has the desire, the patience, the stamina, and the conviction to pursue its rigorous and demanding training. The beauty of the hula is that it can be done anytime, any place and under any condition. It can be done by men and women of all ages. The power of the hula is such that it transcends the performer and observer through time and space. It digs deeply into the emotional well-spring that can draw tears, cheers and “chicken-skin”. The skill of the performer, the music, the sounds, the attire and fragrance all create an atmosphere that can recall a special place; a special person, a special moment. Hula then becomes an illusion. Hula is a way of life. The hula does not require a life-taking sacrifice. The hula is a positive, life-giving force that involves the meanings of Laka (hula god/goddess, to tame, to domesticate, to allure, to attract; fond of, gentle, god of canoe makers), lama (tree, torch, light, lamp, enlightenment; used in medicine), and the deities of the hula. But, I shall not burden you by recounting the deities and their functions, nor the meanings. Instead, the discipline of the hula involves the domestication and taming of one’s self. We are trained to control our self so we may live with and be of service to our fellow beings without compulsory obligation. We are taught to be sensitive, considerate, humble, protective, unafraid, adaptable, and attractive. We are instructed in the art of healing, though today we depend more upon our medical doctors. We are also trained to enlighten so we may encourage moral and spiritual improvement. Again, because of our life-style this part of the training covers a longer period of time. These objectives are achieved through listening, watching, practicing and praying. If one were to study the prayers of the hula, one can only come to the conclusion that the prayers follow a pattern. The format of a prayer is dependent upon the reason for the prayer. The prayers will include recognition, praise, cleansing, forgiveness and request. The prayers are offered in the form of poetry so eloquently stated and released. I alai ia e ke kiohuohu, e ka ua koko. O na kino malu i ka lani e.
Hidden away in the mist, in the low hanging rainbow. Oh, Being, sheltered by the heavens. Clear our path of all hindrance. Oh, Laka, and dwell on your altar. This is my ho`okupu (ceremonial gift-giving as a sign of honor and respect) to you with my warmest regards and aloha.